If you’re worried that someone may be spying on you without your knowledge, the Pro-10G - Bug & Wiretap Detector is here to give you some peace of mind. This compact device lets you locate any wireless device nearby, including audio bugs, GPS trackers, cell phones, and wireless video cameras. It’s completely portable, so you can easily use it at home, around the office, or when you’re driving in your car. 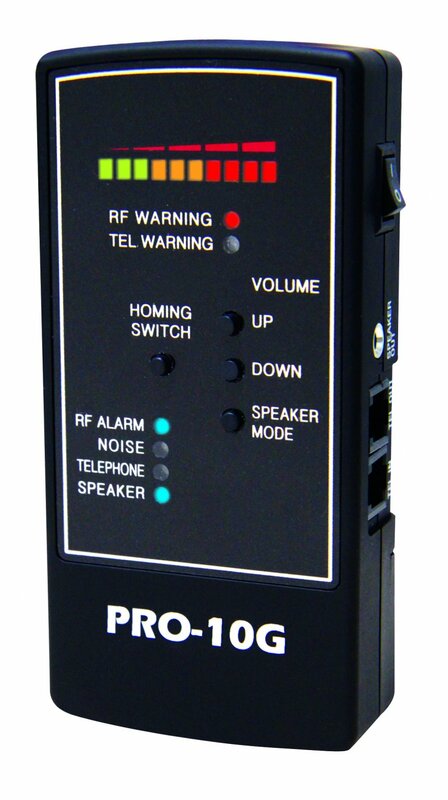 Protect your privacy with the Pro-10G - Bug & Wiretap Detector. The Pro-10G - Bug & Wiretap Detector is the ultimate counter-surveillance tool. It’s equipped with everything you need to detect all kinds of covert devices, such as audio bugs, wiretaps, cell phones, wireless video cameras, and GPS trackers. It detects both analog and digital recording devices. You can rest assured that the Pro-10G - Bug & Wiretap Detector will pick up virtually anything that might be infringing upon privacy. With the Pro-10G - Bug & Wiretap Detector, you don’t have to be right on top of whatever kind of device you’re trying to find. It will detect any wireless device within a 35 to 40 foot radius. You can search large areas and interiors in just a matter of minutes. 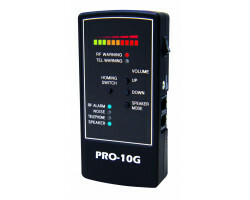 The Pro-10G - Bug & Wiretap Detector lets you search for covert devices with your eyes or ears. You can follow the strength of the signal visually until you find what you’re looking for. The device also comes with an alarm system that will beep whenever there’s a wireless device nearby. If you don’t want to make a lot of noise, just pop on the included headphones and you can protect your privacy without bringing attention to yourself. The Pro-10G - Bug & Wiretap Detector is completely portable, so you’re not limited in where you can use the device. It comes with a 9-volt battery, giving you the freedom to use the device wherever you go. Just bring along an extra battery and you can use the device for hours on end. Overall, the Pro-10G - Bug & Wiretap Detector is easy to use, even for beginners. Setting up the device only takes a few minutes. Just point the Pro-10G - Bug & Wiretap Detector around the room and you can quickly locate any kind of wireless device. You can never be too sure when it comes to the privacy of you and your loved ones. Guarantee that your property is completely secure with the Pro-10G - Bug & Wiretap Detector.